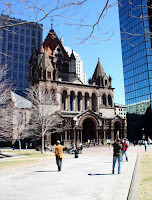 Trinity Church in Copley Square, viewed from Boylston Street. More pictures and information on the architecture of this H.H. Richardson building can be found here. The plaza in front of the church is used for various concerts throughout the year, most in the warmer months.